Charleston Coliseum and Convention Center is a municipal complex located in the downtown area of Charleston, West Virginia. Originally completed in 1959 at the cost of $2.5 million, the Charleston Civic Center has undergone numerous renovations and expansions. The Charleston Civic Center currently consists of three main components: the Civic Center Coliseum, the Little Theater, and the Charleston Convention Center, also referred to as the Grand Hall. In 1953, the first in a series of general obligation bonds was approved by city voters for the construction of a civic center in the downtown area of Charleston, West Virginia between Lee Street and Quarrier Street on the banks of the Elk River just before the Elk River empties into the Kanawha River. When the original Civic Center opened in January 1959 at the cost of $2.5 million, it consisted of a 6,000-seat arena and the 750-seat "Little Theater." The Civic Center underwent its first renovation and expansion in 1964 when 2,400 additional seats were added to the arena and a paved parking lot and an ice rink were added to the facilities. The $1.5 million project was financed through the sale of revenue bonds. The most significant renovation and expansion began when city voters approved a $10 million general obligation bond sale in 1976 to erect a 13,000-seat coliseum, a two-story lobby that connected the new coliseum with the original arena and theater, and remodel the original arena into a convention center. The project also received an additional $10 million in federal matching grants and was completed in 1980. Two parking garages were added in 1983, accommodating up to 1,300 cars. In 1994, the 36,000-square-foot (3,300 m2) Grand Hall of the convention center received a new ceiling, paint and lighting and the ice rink was also converted into an exhibit hall in the 2001. The last renovations took place between 2004 and 2006 when about $250,000 was spent to renovate the Little Theater. After Pride Youth Programs' annual anti-drug convention in early 2007, Jay DeWispelaere, CEO of Pride Youth Programs, commented on what he felt were the inadequacies of the Charleston Civic Center. In May 2015, the Charleston's Municipal Planning Commission approved the permit need to move forward with a planned comprehensive expansion and renovation, expected to cost around $72 million. Construction began in September 2015, with an expected completion date in early 2018. The Civic Center will remain open during construction. As part of a 10-year sponsorship deal with the organization, the Charleston Civic Center's new basketball court (which debuted in the 2011-12 season) is branded with a large logo for Friends of Coal, a locally based political advocacy group. The Charleston Civic Center is a venue for a number of annual events and fairs throughout the year. Among the events includes Annual West Virginia Hunting and Fishing Show, West Virginia Association of Fairs & Festivals Conference, West Virginia International Auto Show, West Virginia Sports Show, the Taste of Charleston, and the Capital City Art & Craft Show. Several local high schools hold their proms and graduation ceremonies at the Civic Center. The Civic Center has also hosted local show choir festivals, including the state competition. The Civic Center Coliseum also hosts the quarterfinals, semifinals and finals of the annual Mountain East Conference postseason tournament, West Virginia State High School Boys and Girls Basketball Tournaments, music concerts, professional wrestling, and hosted basketball games between in-state rivals West Virginia University and Marshall University until that series ended in 2016. The West Virginia State University also holds its commencement ceremonies in the Coliseum. The Charleston Light Opera Guild conducts performances in the Little Theater throughout the year. ^ Thompson, Matthew (May 2, 2007). "Charleston Civic Center: Time for Expansion?". Charleston Daily Mail. p. 1A. 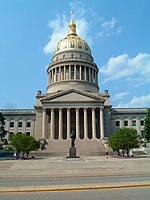 ^ "Get to Know West Virginia Tourism and Hospitality Careers: Charleston Civic Center & Coliseum". West Virginia Office of Hospitality Education and Training. August 5, 2003. Archived from the original on September 29, 2007. Retrieved May 15, 2007. ^ Steelhammer, Rick (April 14, 2007). "'This facility won't work' City Leaders Hear About Civic Center Problems". The Charleston Gazette. p. 1A. Retrieved May 16, 2007. ^ Molenda, Rachel (May 6, 2015). "Charleston Civic Center renovation request approved". The Charleston Gazette. Retrieved July 4, 2015. ^ Rivard, Ry. "Critics call foul on Civic Center's coal-sponsored basketball court logo". Charleston Daily Mail. Archived from the original on January 21, 2013. Retrieved December 7, 2012. ^ "Charleston Civic Center Event Calendar". Retrieved May 16, 2007. This page was last edited on 4 January 2019, at 18:28 (UTC).